Posted on Tue, Apr 27, 2010 : 6:48 p.m. The line for graduation tickets might not stretch past Hill Auditorium anymore, but soon-to-beÂ University of MichiganÂ graduatesÂ continued to make a strong showing today for tickets to Saturday's commencement. Ever since U-M announced President Barack Obama would be the keynote speaker at the May 1 graduation ceremony at Michigan Stadium, commencement has been the hottest ticket in town. Student interest in Obama's commencement speech has not waned. Janice Jenkins, senior marketing and membership manager for the University of Michigan Alumni Association, where ticket pickup is being held, said in a normal year, day one of ticket pickup draws the biggest response - and it trickles off from there. Not this year with a sitting president giving the keynote address. This year, day two of ticket pickup was even busier than day one, Jenkins said with 90 minutes of ticket pickup remaining. "Usually there's more of a trickle at night," Jenkins said as students snaked from the alumni center on East Washington and Fletcher to the west entrance of the Michigan League. But today, it was a steady crowd throughout the day. Students graduating on May 1 are granted up to eight tickets for commencement. Staffers with the alumni association said most students have taken the full allotment. Wednesday is the third and final day of ticket pickup for graduates. Though interest in Obama's commencement speech remains strong, Wednesday's crowd isn't expected to be as big as either Monday's or Tuesday's crowds. That's because most of the student tickets have already been picked up. With an estimated 8,000 students set to graduate Saturday, and nearly 3,000 students grabbing tickets on both Monday and Tuesday, only about 1,500 to 2,000 soon-to-be graduates have yet to secure tickets. Commencement ticket pickup will resume Wednesday morning at 8 a.m. and will continue through 7 p.m. Tickets for the general public and university community will be available from 9 a.m.-5 p.m. Friday - although the university hasn't announced how many will be distributed. Wed, Apr 28, 2010 : 7:48 p.m.
An opportunity to see the first communist President the U.S. has ever had. What an honor!! Wed, Apr 28, 2010 : 1:17 p.m. Even though he can't get anything accomplished he gives a good motivational speech. Where else but in America can someone be born in Kenya, do a little community organizer work and get elected president. If he can do it surely for a U of M grad the sky's the limit. Wed, Apr 28, 2010 : 12:29 p.m.
Who would fork over $10.00 to purchase a ticket to an Obama event so they could see him repeat what his teleprompter tells him what to say....seriously. Wed, Apr 28, 2010 : 10:29 a.m. Whether you like Obama or not, you should respect him. He is the leader of this country, even if you think he is doing a poor job. This is a HUGE local event. How many times do you get to see a President speak? Not very often... Even if a Republican would have won the election and they were coming to Ann Arbor for the commencement speach, I would still want to go and get an opportunity to hear the President speak. Congratulations Graduates! Wed, Apr 28, 2010 : 9:56 a.m.
Lots of grads taking advantage of the opportunity to sell tickets on Craigslist. "I graduated from UM and all I got were these lousy Obama tix." Wed, Apr 28, 2010 : 9:36 a.m.
Maybe he can recruit for the military jobs needed to be filled, since many of our military soldiers men and women are making their 4th and 5th tours in Iraq &amp; Afghanistan he'll have plenty of unemployed college grads attending looking for a job, what a better opportunity for a job fair event along with a little recognition on graduating. Wait a minute, didn't he say he was going to bring the troops home in 18 months? Where's Cindy Sheehan when you need her? Oh, I almost forgot wasn't he the one that said we'll have 4-5 million jobs created just right around the corner? I can't believe AA.com is so naive and hesitant about confronting the real issues in regards of what's happing all over the Country, yet they promote his presence as a second coming and how "what deficit" we apparently don't have and local vendors selling T-Shirts. Maybe it's just me, but apparently many are starting to question his ideologies about what his real motives are? NOT TEA PARTY MEMBER. Wed, Apr 28, 2010 : 8:54 a.m. Incredible opportunity to make a quick buck, good for them, they already know the rhetoric Obama is about to evoke of all those individuals looking for salvation. Wed, Apr 28, 2010 : 8:30 a.m. Right now there are 24 different ads posted yesterday in the Ann Arbor Craig's List tickets section. Prices range from $50.00 - $105.00. If you can get 8 tickets that will buy a lot of beer. Wed, Apr 28, 2010 : 8:25 a.m. Cool, stand in line for 8 tickets and then sell them on Craig's List for a $100.00 each. I would stand in line too. Wed, Apr 28, 2010 : 8:02 a.m. I grabbed my tickets on Monday. @ xmo, thanks to my education at UofM I received multiple job offers in my field of study before I graduate and have accepted a job locally, so it isn't that bad out there. Most everyone I know graduating already have work lined up as well. Wed, Apr 28, 2010 : 7:51 a.m.
Hey, jlcmich, whether you like it or not, this is a big local story, and many mainstream residents are interested in our president's visit. I'm very interested in this story, as I want to gauge whether or not I'm going to be able to get tickets. So, AnnArbor.Com, thanks for keeping this story in the news! Wed, Apr 28, 2010 : 7:47 a.m. 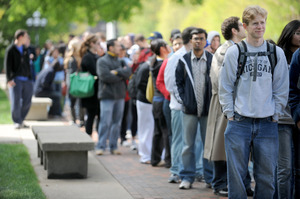 I guess the students are practicing lining up now so when they graduate they can join the lines of the unemployeed. Wed, Apr 28, 2010 : 7:41 a.m.
AnnArbor.com-thanks for not making this the lead story today! I'm not sure why it's not, but I commented on your story yesterday "What deficit? Obama's University of Michigan appearance boosts Ann Arbor economy" and asked why an Obama story had to be the leadoff story every day? Many mainstream residence don't really care that he is coming here. We don't see him as the all-knowing wise President that many in the liberal bubble of Ann Arbor do. So, thanks for making it further down on the list...maybe tomorrow you could just drop coverage altogether? Wed, Apr 28, 2010 : 7:19 a.m. Wed, Apr 28, 2010 : 5:09 a.m.
What an incredible opportunity for these kids.